When the settlers began building the town in 1708 or so, they weren’t the only “newcomers”: A number of American Indians had only recently arrived in the neighborhood. Chicken’s Rock, a large outcropping alongside the Martin Park bathing beach at Great Pond, recalls their leader, Chicken or Chickens Warrups, one of the territory’s most colorful characters in the days of the pioneers. “A large rock on the shores of Great Pond ... is still called Chickens’ Rock, as it was a favorite spot where the old warrior used to sit,” Ridgefield historian George L. Rockwell wrote in 1927. Researcher Franklyn Bearce, who considered himself a descendant of Chicken Warrups, maintains Hurd’s account of a murder in Fairfield is incorrect, and tells a more colorful tale of homicide. “In his youth Chicken first killed an Onandaga youth of nonroyal blood over a girl, and the Grand Council banished him from the Five Nations; had he not been of noble Iroquois blood, he would have paid [for] the murder with his life. 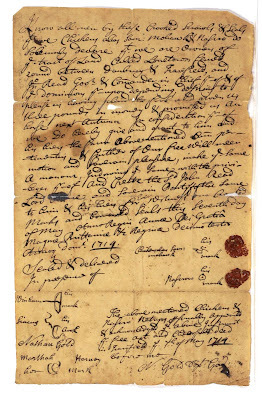 After he was banished and took the trail, he drifted into Connecticut, and … was captured by the Ramapoos, and his life was saved when the daughter [of] Catoonah claimed him for a husband.” That’s the same Catoonah or Katonah who was the Indian leader who sold the Ridgefield settlers their first 20,000 acres in 1708. That rumor sparked “considerable apprehensions of danger from Indians, fearing that the belts have been sent on some bad design”—namely, plans to invade the “frontier towns” like Redding, Ridgefield and Danbury. The governor and the colony council ordered a meeting with Warrups about the “threat” and while Todd found no official record of what happened, one can assume that no Indian invasion occurred, and none probably was ever contemplated by the natives themselves. 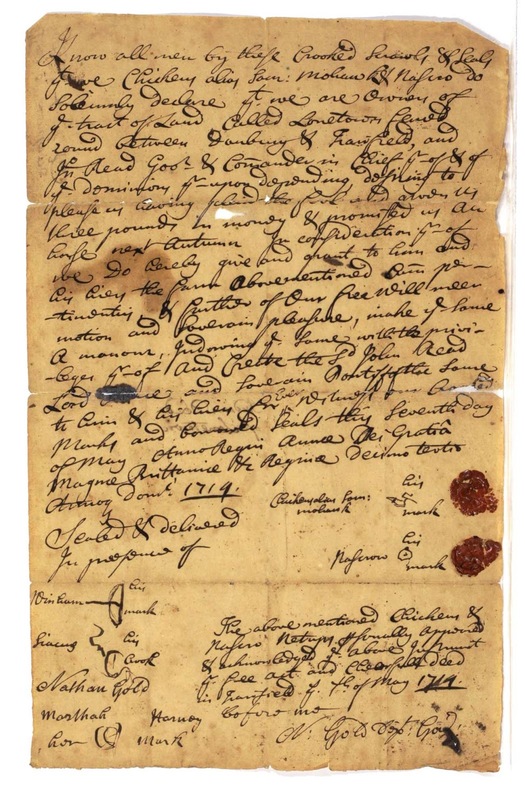 Any concerns about Chicken Warrups came to an end in 1749 when the chief took John Read’s offer of 200 acres near the Schaghticoke Reservation along the Housatonic River in Kent, giving up any rights to his old lands in Redding. It is said Warrups found the fishing and hunting better in Kent. He died about 1765. He was survived by a son, Tom Warrups, who served with the American forces in the Revolutionary War, enlisting from Redding. The Warrups family continued to create concerns in Redding long after Chicken’s death. In 1815 Redding selectmen noted in their minutes, “Eunice Warrups, an Indian woman, was born in this town, is upwards of 70 years old; has been absent 50 years; came from New Milford, she says, 1st day of Nov; came to this town; was warned to depart.” Towns back then were finicky about whom they admitted. They feared indigents; under law, once indigents had established themselves in a community, the selectmen could become responsible for their welfare. Hence, the tight-fisted officials in towns like Redding and Ridgefield often ordered indigents to leave before they could become welfare cases. Eunice may have been a daughter or granddaughter of Tom Warrups, that Revolutionary veteran. If so, one would have thought she’d have been better treated. While Chicken’s Rock is in Ridgefield, within an arrow’s shot of Redding, it may once have been within a small wedge of Redding land that projected into Ridgefield and that had been part of “Governor Fitch’s Farm,” a 120-acre tract that was in both towns. As a result of a 1786 petition to the General Assembly, this wedge—including perhaps the rock—became Ridgefield territory.